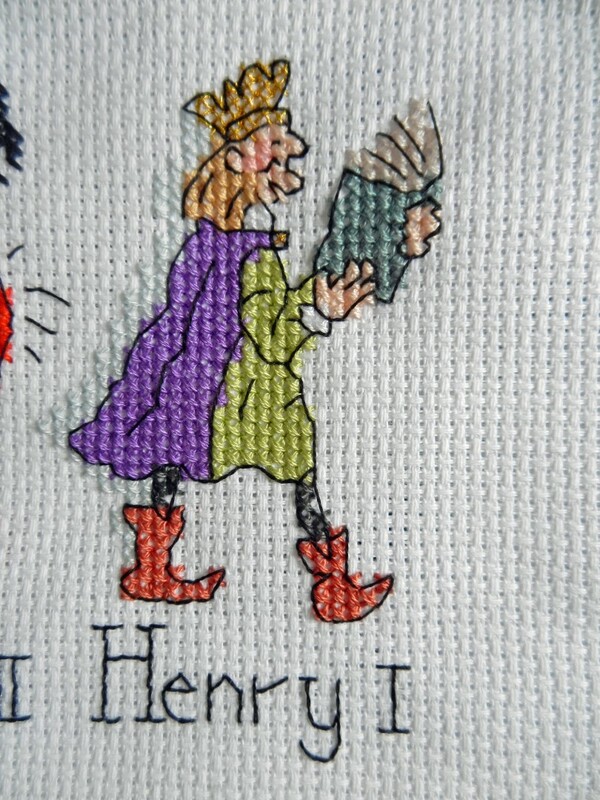 Henry I is all finished on my project. Must admit that I groaned when I noticed this monarch had gold as I'm not a fan of metallic threads but the thread in this project stitched up beautifully...hurray! Henry was born in England in 1068 or 1069, the fourth son of William the Conqueror. When Henry's elder brother became king another elder brother had died and left only Robert and Henry as the heirs. When William was killed in a hunting accident in August 1100 Henry had himself crowned a few days later, taking advantage of Robert's absence on crusade. Robert invaded England in 1101 but relinquished his claim in return for Henry's territories in Normandy. This peace didn't last long and Henry invaded Normandy and in 1106 he captured Robert and held him prisoner for life. Henry's only legitimate son, William, died in a shipwreck in November 1120. This left Henry without another legitimate male heir despite remarrying in order to have another son. He eventually named his legitimate daughter Matilda his heir after summoning her back to England. He married her to Geoffrey Plantagenet, another member of the Angevin family. Henry died in December 1135, there was a succession crisis which led to civil war as English barons did not want to be ruled by a woman and an Angevin. Eventually his nephew Stephen succeeded to the throne.